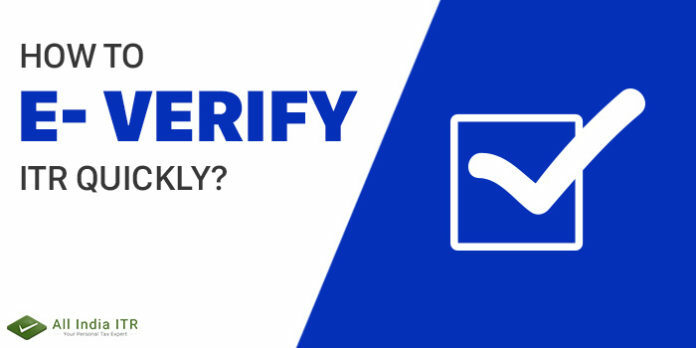 How to E- Verify ITR quickly? Once you file your Income Tax Return, you will have to send your ITR-V or ITR acknowledgement to CPC Bangalore, that is when your ITR Filing Process completes. Remember if you fail to send your ITR-V to CPC Bangalore either electronically or manually, you will have to do it within 120 days of fling your ITR. If you fail to do so, the IT Department will consider your ITR as never filed. For availing this process, you will have to log in to your e-filing account in the official Income Tax Return E-filing website. Then you will have to click on the option that says, Generate Aadhar OTP to e- verify my Income Tax Return. You will be provided an OTP on your contact number that is registered with your Aadhar Card. You must know that this One Time Password will only be valid for 10 minutes. Next, you will have to enter the OTP for verification of your Income Tax return. On successful validation, the return is verified, and you may download the acknowledgement for the same. For this process, make sure your Aadhar number is linked to the registered mobile number. To avail this E- Verifying process you will have to log in to your net banking account, using your net banking credentials. There will be a tab related to income tax filing on your home page. On selecting the e- verify option, the page will be redirected to the government’s ITR e-filing portal. Clicking on my account option on the e-filing page, you will receive an EVC on your registered email ID and registered mobile number. Using the EVC provided to you, you may verify your income tax return. Before you use this verification mode, you must ensure that your bank is authorised by the income tax department for providing such facilities. Your income must be below Rs. 5,00,000 and you shouldn’t have claimed a refund. Next articleHow to Calculate your Taxable Income?